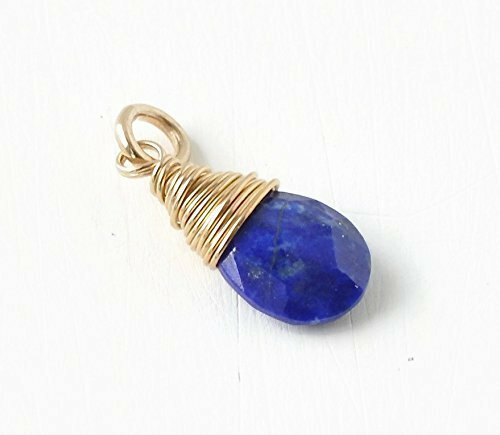 A small faceted lapis lazuli briolette is wire wrapped by hand in gold fill to create this charm/pendant. The bail is an open jump ring, which will need to be open/closed with pliers to place on jewelry. This listing is for an individual charm only and does not come with a chain. These are natural stones and some slight variations in color may be present. Lapis is an alternative birthstone for September, making this a great birthday gift for someone born in that month. What is gold filled jewelry? Gold-filled jewelry, has a solid layer of gold bonded with heat and pressure to a base metal core, such as brass. The gold layer in gold-filled items is substantially thicker than gold plated items, and does not flake or chip off. This makes gold-filled jewelry a durable choice, second only to solid gold itself. If you have any questions about this product by Blue Room Gems, contact us by completing and submitting the form below. If you are looking for a specif part number, please include it with your message.